New York, the most vertical of cities, has become a tad blasé about its skyscrapers, high-rise malls and multistory restaurant collections. At last, though, it has a fresh take on the perpendicular: the vertical food-truck court. The result is something like an elevator ride in a department store imagined by Willie Wonka. The other day on the 12th floor, Van Leeuwen Artisan Ice Cream was hawking its Michel Cluizel chocolate cones ($4). On Floor 15, the Treats Truck was dispensing its Chocolate Trucker Sandwich Cookies ($1.75) and the occasional Kitchen Sink Crispy ($3). On 17, Coolhaus Ice Cream Sandwiches was selling its decidedly vertical Three-Story concoctions — two scoops of ice cream served between two cookies ($9). Downstairs, in front of the entrance, Valducci’s Original Pizza offered thin-crust Sicilian pizza with fresh basil ($4 a slice). On the street, a Rickshaw Dumpling Truck did a brisk trade in chicken-Thai-basil dumplings with peanut satay dip ($6 for three). “This is the first indoor vertical food-truck court in the city, and as far as I know, the country,” said David Weber, president of the New York City Food Truck Association, which was asked three months ago by the building’s owner, RXR Realty, to bring in a rotating roster of a dozen food trucks, including Mexicue, Red Hook Lobster Pound Truck and the Gorilla Cheese Truck. The problem, according to RXR, was a paucity of lunchtime choices in the neighborhood, an industrial-looking stretch west of the High Line, between 11th and 12th Avenues. 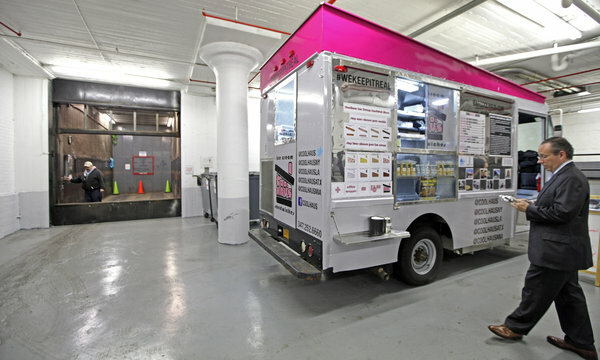 Although lone food trucks have occasionally ascended freight elevators in Manhattan buildings to cater special events, Mr. Weber said the Starrett-Lehigh Building was the only high-rise in New York where multiple trucks converged five days a week. Indeed, the building has now become the city’s third food-truck court, as truck owners search for places to park without receiving a ticket or being ordered to move by the police. The food-truck association opened its first last year in Long Island City, Queens, on a lot owned by Rockrose Development Corporation. In February, the association established a second, overlooking the Hudson River near 4 World Financial Center, under the auspices of the Battery Park City Authority and Brookfield Office Properties, owner of the center. In the Chelsea building, vendors on the upper floors can be visited only by the roughly 5,000 people who work in the building and visitors approved by the security desk, who average about 1,000 a day. For many workers, the trucks are a welcome presence — even if (or perhaps because) so many are selling sweets. “So far, it hasn’t hurt my waistline,” said Carl Auge, an exhibition coordinator at the School of Visual Arts Gallery, who was sampling a $1 oatmeal cookie from the Treats Truck. In the passenger elevators, placards titled “Truck Bay Gourmet” announce the “Savory and Sweet Truck Schedule” — a guide to each day’s fleet. The fortresslike building, with its robust floor plates and concrete bays, was designed to bring supply trucks directly up to a congeries of production, storage and repackaging companies, for deliveries and exports. Now, most of the industrial tenants have departed in favor of advertising and design firms, as well as Martha Stewart Living, Hugo Boss and Tommy Hilfiger.